This talk will discuss the different ways the ‘arrival’ of Buddhism in Japan in the mid 6th century AD has been seen over time by a variety of observers, artists and other specialists, and the impact of recent archaeological excavations on understanding the adoption of Buddhism in Japan and its East Asian context. The subject of this talk relates to a new exhibition project that Simon is developing to be held at the Sainsbury Centre for Visual Arts at the University of East Anglia in 2020. 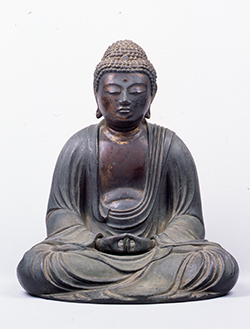 The exhibition will be comparing the appearance of Buddhism in Japan and the adoption of Christianity in north-western Europe – the arrival of world religions at the extremities of the Silk Roads. Dr Simon Kaner is Director of the Centre for Japanese Studies at the University of East Anglia and Head of the Centre for Archaeology and Heritage at the Sainsbury Institute for the Study of Japanese Arts and Cultures. He is an archaeologist specialising in the prehistory of Japan. His recent publications include An Illustrated Companion to Japanese Archaeology (edited, with Werner Steinhaus) (Oxford, Archaeopress, 2016) and he is currently editing the Oxford Handbook of the Archaeology of Korea and Japan. He is Co-Editor of the Japanese Journal of Archaeology, Series Editor for the Archaeopress series Comparative Perspectives on Japanese Archaeology and Series Co-Editor for the Springer series The Science of the History of Humanity in Asia and the Pacific. He is currently directing a project on Global Perspectives on British Archaeology (www.global-britisharchaeology.org). The Third Thursday Lectures hosted by the Sainsbury Institute for the Study of Japanese Arts and Cultures are on a range of topics related to the art and culture of Japan. Talks begin at 6pm (50-minute lecture followed by refreshments). Speakers are all specialists in their field and the talks are intended to be accessible to those with no prior knowledge of Japanese history. The lecture will be held at the Weston Room, Cathedral Hostry, Norwich NR1 4DH. The Third Thursday Lecture series is funded by the Great Britain Sasakawa Foundation, Yakult and the Robert and Lisa Sainsbury Charitable Trust.